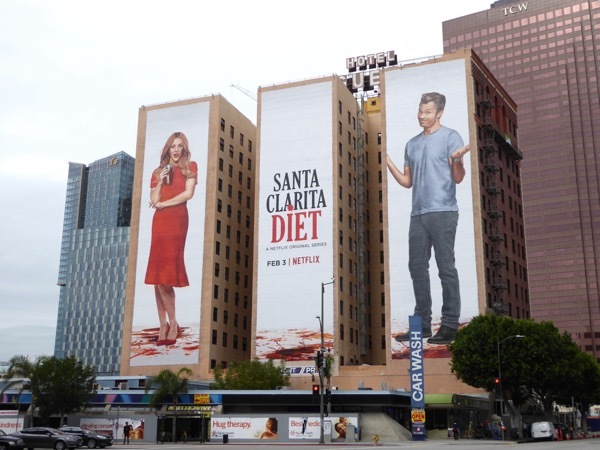 Netflix seem to be on fire at the moment with the outdoor ad campaigns for their new shows, like these fun billboards for the bloody funny new comedy, Santa Clarita Diet. 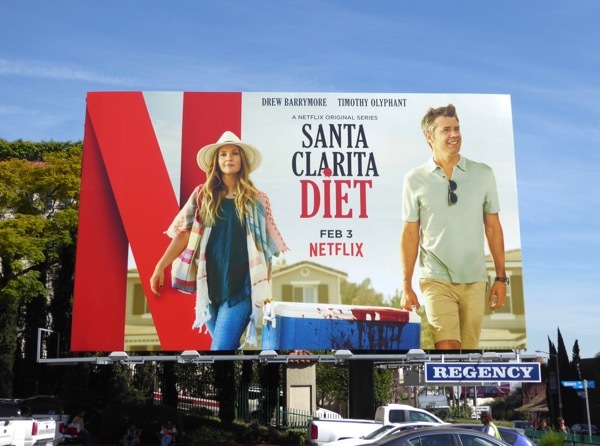 Drew Barrymore and Timothy Olyphant star as married real estate agents, 'Sheila' and 'Joel' living in Santa Clarita, California, when their lives take a dark turn after Sheila dies. 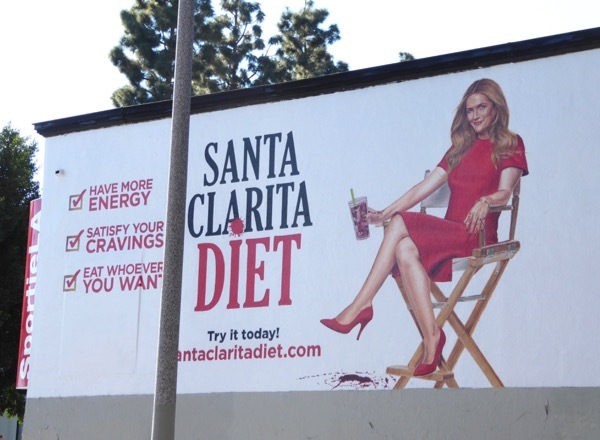 It turns out death becomes her, but one of the downsides of being a zombie is that she needs a human flesh diet to sustain her new undead life. 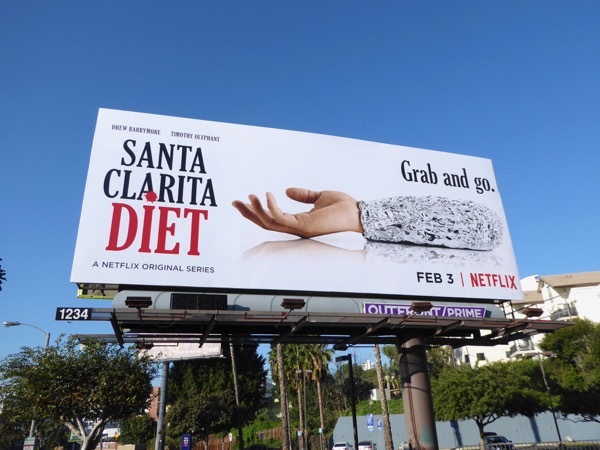 And because Joel said 'in sickness and in health' turns out he's okay with helping his wife getting the essential nutrients she needs to survive. 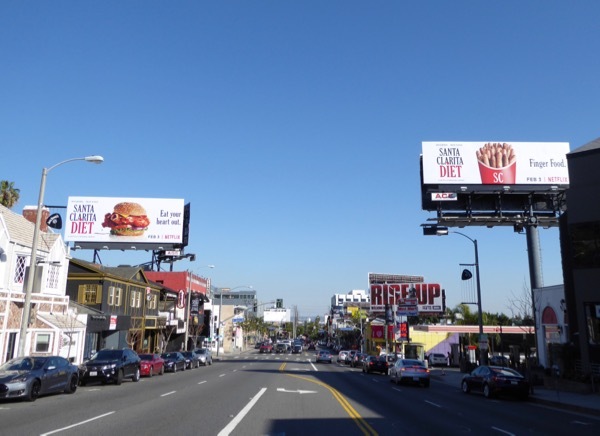 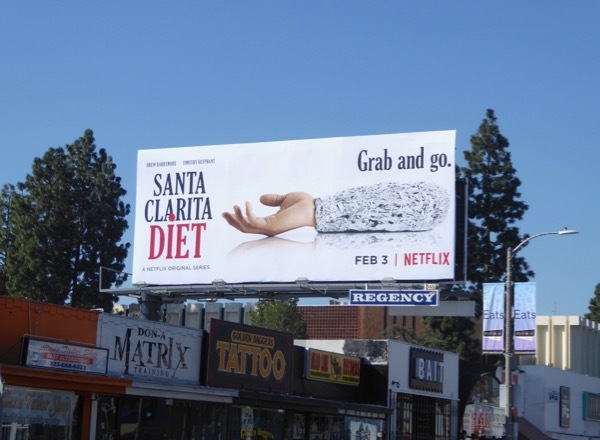 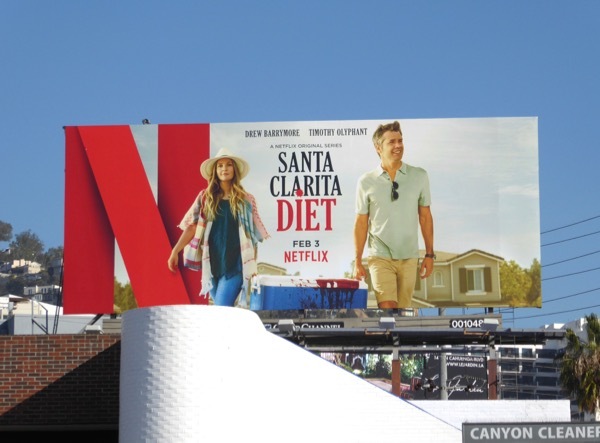 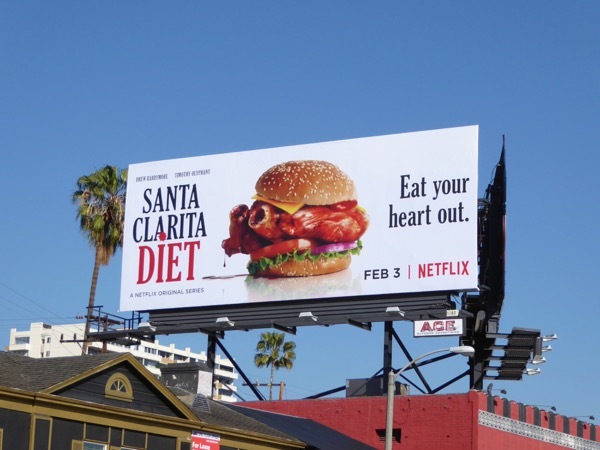 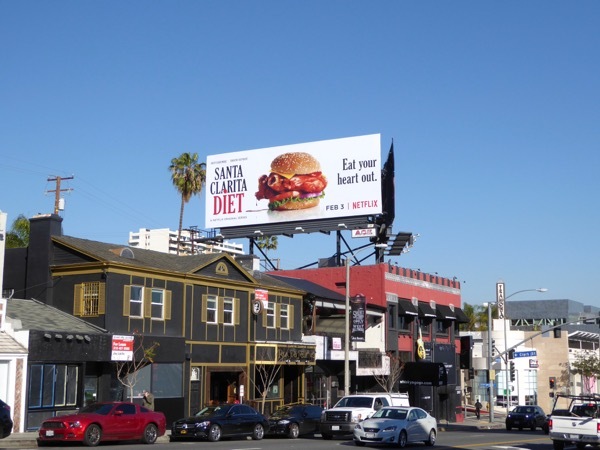 This humorous outdoor advertising campaign for Santa Clarita Diet was photographed around the streets of L.A., including the Sunset Strip, Melrose Avenue and Santa Monica Boulevard, from January 25 to February 1, 2017. 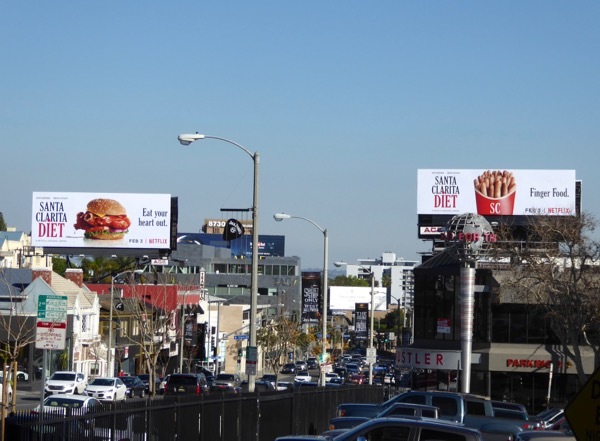 Daily Billboard isn't quite sure we can look at french fries, hamburgers, burritos, or freshly squeezed juice in the same way after seeing these hilarious, yet slightly gruesome ad creatives. 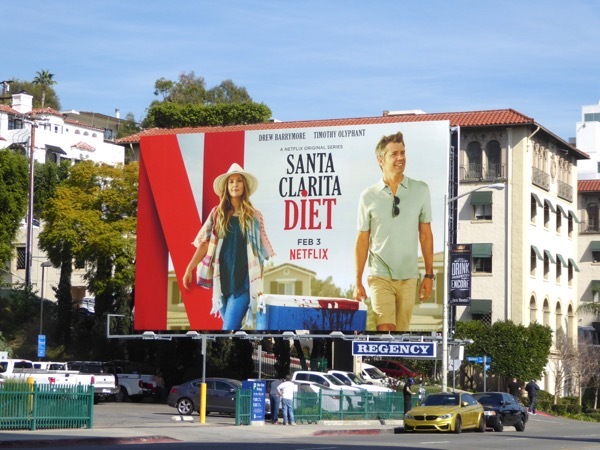 Fans of Drew Barrymore can also enjoy these Going The Distance movie billboards from 2010 and these Blended movie billboards from 2014. 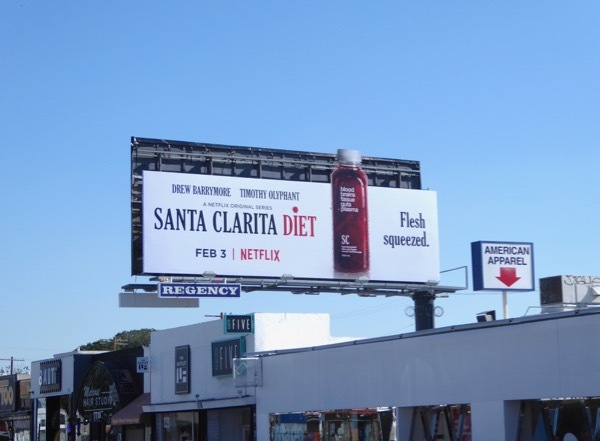 Meanwhile admirers of Timothy Olyphant can check out six seasons of promo billboards for TV's Justified here too. 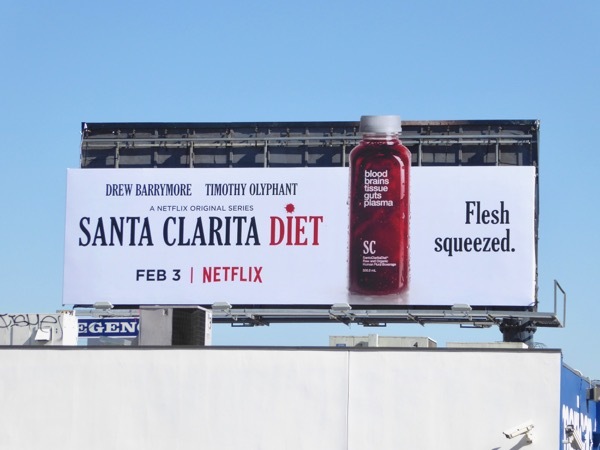 Plus for more gory ad creatives you can take a look at this season three billboard for The Vampire Diaries and this Children's Hospital season seven billboard. 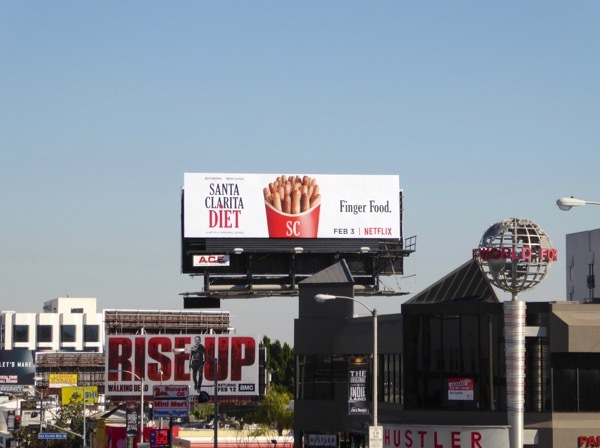 Is anyone else feeling hungry about now, and is that a bad thing? 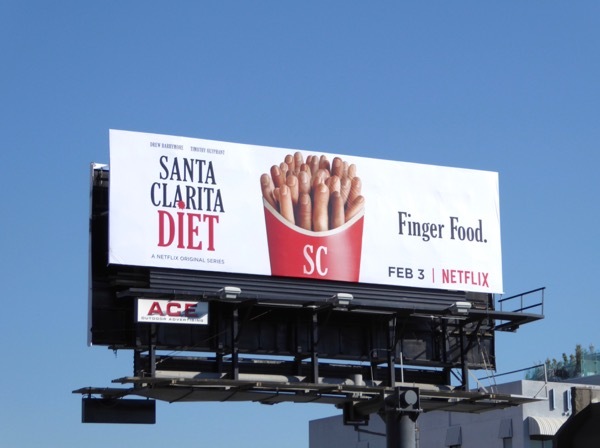 Maybe binge-watching this new series will satisfy your cravings. 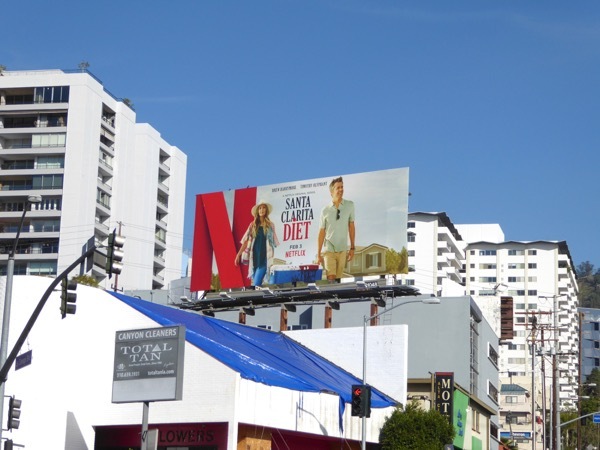 UPDATED: Fans of the Netflix show can also enjoy these super-sized billboards photographed in Downtown L.A. on the side of the Figueroa Hotel on February 21, 2017.